by Dr. Christopher Chang, last modified on 3/20/19. Conservative treatment includes gargling, water pick rinses, and even manual expression to pop them out (typically with blunt end of toothbrush or a finger). Read more about non-surgical treatment here. First of all... we do offer laser cryptolysis, but ONLY if a few spots require treatment. If the "entire" tonsil surface needs to be treated, coblation is used instead. Coblation cryptolysis was developed by Dr. Chang and can be performed awake and using only local anesthesia (in most patients) in order to try and cure patients of tonsil stones (also known as tonsiloliths). 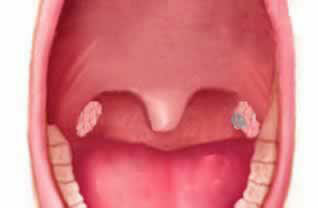 Although there is no guarantee that this method will cure folks of tonsil stones (no more or less than laser cryptolysis), it is a less painful alternative method to consider and try before tonsillectomy which is the only known near 100% cure for tonsil stones (ie, as long as tonsils exist, there's always the potential for tonsil stones). 1) Coblation can treat the entire tonsil surface quickly and completely. Laser can only address a few spots. 6) There's some question whether there is an increased risk of life-threatening bleeding with laser use, mainly because the laser can potentially pierce tissue like an arrow. Not an ideal characteristic because the carotid artery is < 1 cm away from the tonsil. Read an article about a boy who died after laser tonsillectomy due to this complication. The laser we use in our office is a 1064nm diode laser which works more on tissue contact rather than shooting out like a bullet like some other lasers. 6) At best, it only has an 80% chance of success (meaning this procedure will fail to resolve tonsil stones in 20%). The reason is because there are STILL tonsil tissue left behind with this procedure which can recreate the holes/pits where tonsil stones are produced. To address tonsil stones, most patients (60-70%) require only a single session to get treated. However, 30-40% of patients require 2 or more sessions spread out over several months to get fully treated for tonsil stones. About 20% of patients may not respond to this method of treatment at all. Please note that if there is any concern for tonsil cancer, tonsillectomy should be pursued. Cryptolysis should not be done as there is no pathological specimen obtained. Who is the ideal patient for AWAKE coblation cryptolysis? 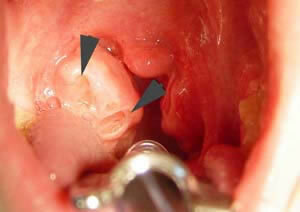 4) Only a few (1-3) discrete areas where tonsil stones typically occur which can be easily seen when opening the mouth. If you have numerous areas of tonsil stone production, coblation tonsil resurfacing may need to be pursued (instead of laser). Tonsil stones produced at the base of the tonsil, in the groove between tonsil and throat, and next to tongue are also difficult to address in an awake state. 5) Tonsil problems dealing mainly with tonsil stones or cryptic tonsils. Not chronic tonsillitis or strep throat. If the critera stated in #1-4 does not apply to you, SEDATED cryptolysis would be required. Great! I want a coblation cryptolysis performed! What do I do next? Give us a call to make an appointment to get an evaluation done to see if you are a candidate! Awake coblation or laser cryptolysis IS covered by insurance that we participate with. An evaluation is required first prior to scheduling the procedure. Coblation cryptoloysis is ONLY performed on Friday afternoons if done awake; sedated cryptolysis is performed typically on Monday and Wednesday mornings. Laser cryptolysis can be performed during any clinic hours. Procedure consent can be downloaded here. Post-procedure instructions can be downloaded here. Local anesthesia is applied to the oropharynx and tonsils if done awake. If not, the patient is placed under general anesthesia. Did you know that Dr. Chang was the medical expert for a PBS show on tonsil stones? Click for more info! Coblation is performed to the tonsil crypt where tonsil stones typically come from. The crypt is ablated with coblation such that the "crypt" no longer exists. Once the area is completely healed up in about 3-4 weeks, the bad breath will resolve and the tonsil will look pretty much back to normal without the crypt (and hopefully no more tonsil stones)! These pictures were obtained with the patient under general anesthesia due to a bad gag reflex. The tonsil crypts where stones were coming out from are denoted by arrowheads. Before the Procedure: 2 fairly large tonsil crypts which have been producing stones. After the Procedure: The two crypts have been completely obliterated with coblation. This procedure is covered by insurance. Laser cryptolysis is performed in the office and no hospital or anesthesia charges are incurred. HOWEVER, coblation cryptolysis is performed at Fauquier Hospital as an outpatient procedure. As such, a patient who undergoes this procedure will receive two billing statements... one from our office for the surgeon's fee and another from Fauquier Hospital for hospital charges. If sedation is needed, an additional anesthesia charge will be incurred. Please note that our office has NO control over what charges the hospital bills for as well as how much they charge. Any complaints with hospital charges should be directed to their billing department. Again, we have no say, influence, or authority over what the hospital charges. You can reach Fauquier Hospital's finance department at 540-316-2970. Only for those patients who do NOT have insurance, a discounted price from ONLY our office will be provided. We should also add that our office receives absolutely NO payments, fees, or kickbacks whether financial or not from the hospital. It would be considered illegal as well (Stark Laws). On a related note, media has written stories about this situation, especially given how surprisingly high hospital charges can be. Read a story about this issue here as well as here. Read blog article. At this time, we are accepting new patients from the Northern half of Virginia only (within 2 counties of Fauquier County). You can appeal this limitation by sending us an email. Appeals by phone will NOT be accepted. In only very rare and selective cases have we made exceptions. Read why we instituted this policy. We do not maintain a list of physicians who offer this procedure throughout the United States. Your best bet is to contact your local ENT and ask if they or anybody they know offers this locally to where you live. This website maintains a list of providers as well, but we do not vouch for or know whether it is accurate or not. Also, please be aware that should you wish to see Dr. Chang, this procedure is generally NOT performed on the same day of the visit. The procedure (which is performed only on Friday afternoons if unsedated) will be scheduled only after Dr. Chang performs an intial evaluation. If you live far away, please email Dr. Chang your interest along with a picture of your tonsils to ensure you are a candidate for the procedure (if you are not a good candidate, we do not want to waste your time and expense to see us). When you take the picture, make sure it looks like the picture shown to the right with full exposure of the tonsils and uvula (use a tongue blade if you have to). If you have a bad gag reflex and as such, not able to take the picture as shown here, you are not a good candidate for the procedure performed without sedation (it will have to be done in the operating room under general anesthesia and intubation with correspondingly much higher costs). PLEASE keep in mind that at least for our practice, follow-up visits after the procedure is recommended. If you are not willing to commit to possible follow-up appointments, do NOT make an appointment with us. Why are we requiring this? After this procedure, it is not unusual that a patient may experience some problems or encounter a situation in which they are not sure what to do. In this scenario, it is very difficult if not impossible to answer questions over the phone without an examination leading to frustration and even anger (as follow-up examinations are very inconvenient especially if you live far away). As such, do NOT make an appointment with us unless you are willing to commit to follow-up visits. Although not mandatory, a routine follow-up appointment is generally made for 2 weeks after the procedure. DID YOU KNOW that a person has a total of FOUR tonsils... one adenoid, two tonsils, and one lingual tonsil. The lingual tonsil is located on the back of the tongue. When lingual tonsils start to cause problems, they also can be removed. If your tonsils and/or adenoids are affecting your quality of life, please contact our office for an appointment. Christopher Y. Chang, Thrasher R. Coblation Cryptolysis to Treat Tonsil Stones. ENT Journal. 91(6):238-240. June 2012. Should Toothbrushes be Thrown Out After Strep Throat? What is the BEST Way to Disinfect a Toothbrush? Voice Sounds Different After Tonsillectomy and/or Adenoidectomy!